With so many good people feeling depressed, let’s point to the positive things that happened, even in this really, really bad year. 1. #MeToo movement has empowered victims of sexual harassment and assault, and encouraged accountability. Those two small words defined a social media-based movement in which women, and some men, have come forward to publicly share their stories of sexual assault and harassment, and expose their abusers. The movement–and fallout–spread globally, with the hashtag trending in at least 85 countries. The bravery and solidarity of these victims of sexual abuse will help build a future in which impunity for sexual predators is no longer the norm. 2. The year has seen an explosion of grassroots organizing, protest, and activism. An active and uncompromising spirit of revolt has blossomed in the face of a frightening political climate during Donald Trump’s presidency. On January 21, two million people took to the streets in Women’s Marches across the world as a show of solidarity against Trump’s vile and misogynistic rhetoric. On January 29, thousands gathered in airports around the country to protest Trump’s xenophobic and unconstitutional Muslim ban. 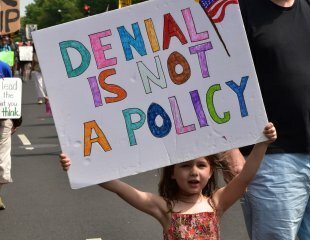 In April, 200,000 people joined the People’s Climate March to stand up to the administration’s reckless stance on climate. In July, disability rights activists staged countless actions on Capitol Hill in response to the GOP’s cruel and life-threatening healthcare bill. In November and December, “Dreamers” protected by Obama’s provision called Deferred Action for Childhood Arrivals (DACA) stormed the Hill to demand a replacement for that program, which Trump ended in September. New groups like Indivisible have helped millions of Americans confront their members of Congress, roughly 24,000 people joined the Democratic Socialists of America, and organizations like the ACLU and Planned Parenthood have seen massive surges in donations. 3. We’re already seeing rebukes of Trump at the ballot box. A wave of Democratic electoral victories swept some unlikely regions of the country, showing popular rejection of Donald Trump and his party. Republican gubernatorial candidate Ed Gillespie, who ran a shameless race-baiting campaign, lost by a wide margin to Democrat Ralph Northam in Virginia. In New Jersey, Phil Murphy handily defeated Lt. Governor Kim Guadagno, making that state the seventh in the nation with Democratic control over legislative and executive branches. In Alabama’s special election to fill Jeff Sessions’ vacant Senate seat, Democrat Doug Jones took the lead over alleged sexual predator Roy Moore–an astonishing win in a deep red state, propelled largely by Black voters. Danica Roem in Virginia, who ran against a virulently anti-LGBTQ opponent, became the first openly transgender person elected as a US legislator. Her win ended 26 years of Republican rule in that district. And in Virginia’s 50th district, self-described democratic socialist Lee Carter defeated powerful Republican delegate Jackson Miller. 4. The first group of J20 protesters, people arrested in Washington DC on the day of Trump’s inauguration, were found not guilty. It was a scary year for the 194 protesters, journalists and medics facing multiple felony charges, including rioting and property destruction, that could have resulted in prison terms of up to 60 years. The state’s attempt to collectively punish almost 200 people for property destruction committed by a handful is an outrageous example of judicial overreach in an era in which First Amendment rights are under siege. On December 21, however, the jury returned 42 separate not-guilty verdicts for the first six defendants to stand trial. Their acquittal on all charges hopefully portendss more non-guilty verdicts for the remaining 188 defendants and gives a boost to our basic rights of free speech and assembly. 5. Chelsea Manning was released from prison after 7 years. Army Pvt. Manning was first detained in 2010 and ultimately convicted of violating the Espionage Act after she leaked troves of documents exposing abuses by the US military, including a video of American helicopters firing on unarmed civilians in Baghdad, Iraq. She was sentenced to 35 years in prison. She developed post-traumatic stress disorder in prison and was repeatedly denied medical treatment for her gender dysphoria. The Army finally granted her the treatment after she went on a hunger strike. On January 17, 2017, President Obama commuted Manning’s sentence, and she was released in May. We owe Chelsea Manning a debt of gratitude for her tenacious commitment to exposing the crimes of U.S. empire. 7. Trump’s presidency has deepened the critical national conversation about racism and white supremacy. The Black Lives Matter movement, which started under Obama’s administration, exposed this nation’s systemic racism. The victory of Donald Trump emboldened white supremacists, as evidenced in the violent Charlottesville neo-Nazi rally in August. But the year has also seen a wave of opposition to racism, Islamophobia and anti-semitism that includes the toppling of confederate flags and statues, confronting hate speech, demanding the removal of white supremacists Steve Bannon, Sebastian Gorka and Stephen Miller from the White House (two of the three are gone), and building strong interfaith alliances locally and nationally. 8. This was the year the world said no to nuclear weapons. While Donald Trump taunted North Korea’s Kim Jung Un (“Little Rocket Man”) and threatened to tear up the Iran nuclear deal, on July 7, 122 of the world’s nations showed their rejection of nuclear weapons by adopting an historic Nuclear Weapons Prohibition Treaty. The treaty, opposed by all nine nuclear states, is now open for signatures and the ban will come into effect 90 days after being ratified by 50 states. The organization that promoted this ban is The International Campaign to Abolish Nuclear Weapons (ICAN), an alliance of 450 nongovernmental organizations in about 100 countries. It was thrilling to learn that ICAN was awarded this year’s Nobel Peace Prize in Oslo. The treaty and the Peace Prize are indications that despite the intransigence of the nuclear-armed states, the global community is determined to ban nuclear weapons. 9. ISIS no longer has a caliphate. For peace activists, it’s hard to put forth military actions as victories, especially when these actions incur a large civilian toll. This is indeed the case with ISIS, where at least 9,000 civilians were killed in the battle to retake the northern Iraqi city of Mosul. But we do have to acknowledge that taking away ISIS’ territorial base has put a stop to some of the group’s horrific human rights abuses. It will also hopefully make it easier to find a settlement to the dreadful wars that have been raging in Syria and Iraq, and give our government one less excuse for dumping so much of our resources into the military. 10. The global community stood up to Trump’s stance on Jerusalem. In a stinging rebuke of President Donald Trump’s controversial decision to declare Jerusalem the capital of Israel, 128 countries, including some of the US’s most trusted and reliable allies, voted in favor of a United Nations resolution calling for a reversal of his position. Despite the threat from US Ambassador to the UN Nikki Haley that the US would be “taking names” of those who voted against it, only nine countries voted with the US and 25 abstained. The resolution isn’t binding, but it’s a stark illustration of just how isolated the United States is in its stance toward Israel.